Based on the historical king credited with uniting most of Europe in the early Middle Ages, the Sword of Charlemagne with Sheath is a stunning, stainless steel replica of Joyeuse, the personal weapon supposedly used by Charlemagne. Subtle etching appears at the ricasso of the sword blade, near the straight crossguard. The arms of the guard are shaped like winged heraldic beasts, their roaring mouths faced outward. At the center of the crossguard, between the two beasts, is a green rectangular emblem. Styled to resemble a wire wrapped handle, the textured grip creates the look of a firm hold. Ornate Celtic beasts surround a red emblem upon the half circle pommel. Antique brass coloration finishes the structure of the hilt as well as the matching detail on the included sheath. 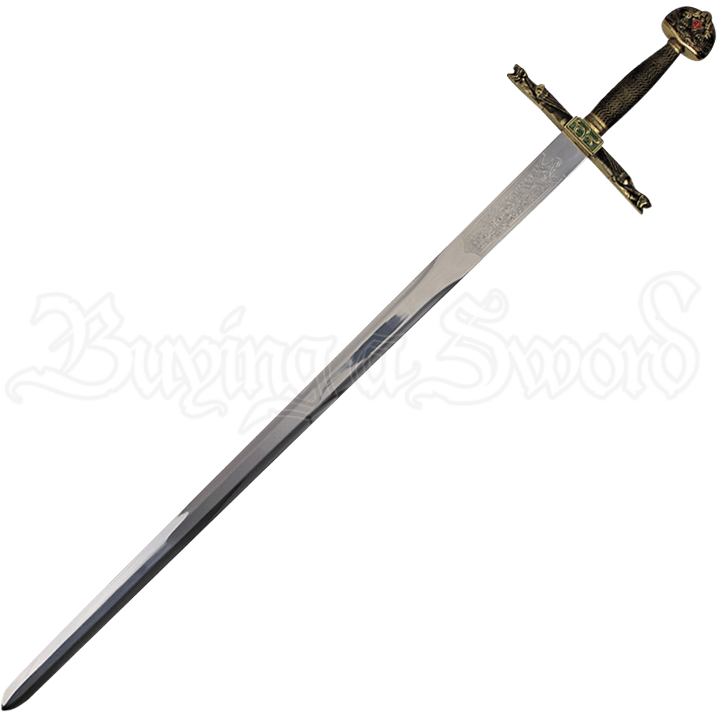 An essential addition to sword collections and historic displays, the Sword of Charlemagne with Sheath is a beautifully detailed, decorative weapon for sword enthusiasts and history buffs alike.